Below please find information on the Pre-Convention Tour including downloadable maps. We are working on a special luncheon for AROC members and Alfa Romeo Race drivers. 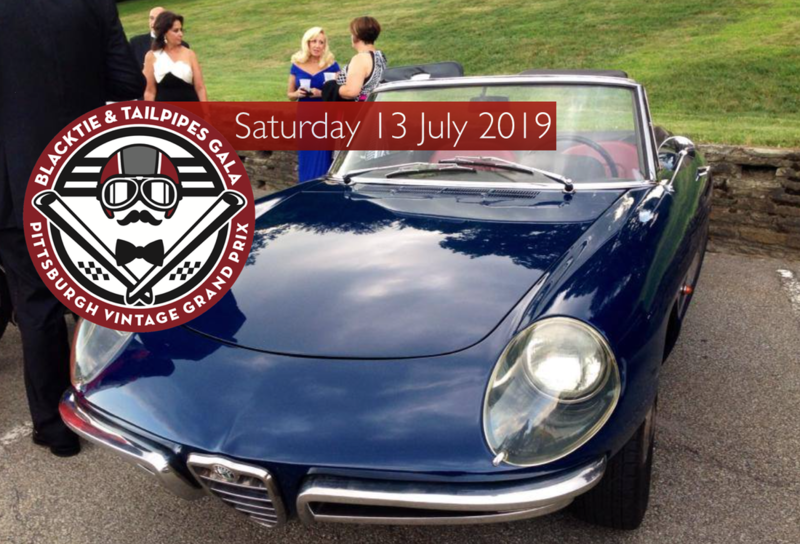 Join the PVGP at the Carnegie Museum of Natural History for the Black Tie & Tailpipes Gala and celebrate the start of 2019 Race Week in style. This formal event is a must for any auto enthusiast who enjoys fine cars, dining, dancing and great company all for the benefit of our deserving charities. 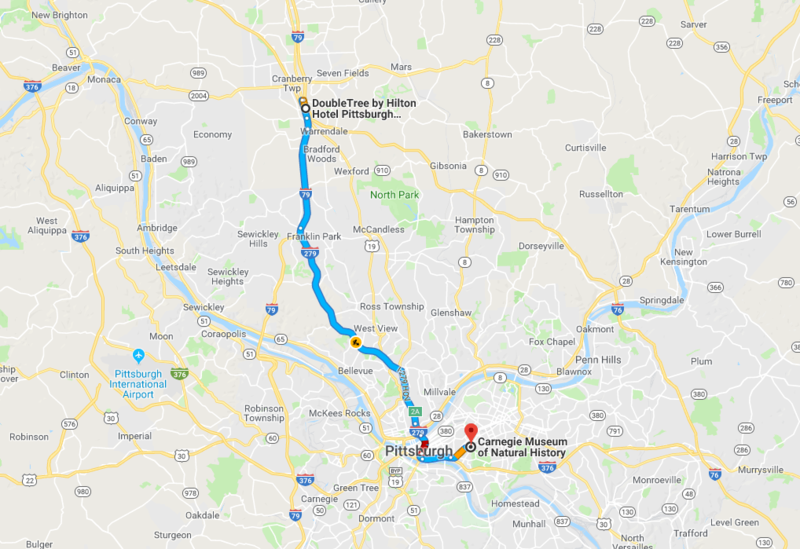 Directions from Doubletree Hilton to Carnegie Museum of Natural History..
A tour overview meeting will be held on Saturday Night at 8pm at the hotel. Tour Groups departs in groups of 5 cars and travel two lanes roads through historic North Park, which is the largest county park & consists of over 3,000 acres of winding wooded trails, a 75–acre lake with a stunning boathouse built in 1934, and a variety of sporting facilities. You then pick out the Green Belt through the community of Fox Chapel until your cross the Highland Park Bridge. You will then wind your way through the middle of the Pittsburgh Zoo and Aquarium and Highland Park Reservoir until your reach Negley Ave that takes you through a sampling of City Neighborhoods. Opened in 1893, the historic landmark is just a few miles from downtown Pittsburgh in Schenley Park. We will explore the beauty and wonders of nature at Phipps Conservatory and Botanical Gardens, encompassing 15 acres including a 14-room glasshouse and 23 distinct gardens. Experience industry-leading sustainable architecture and green practices, stunning seasonal flower shows, exclusive commissioned exhibits, renowned orchid and bonsai collections and more. This entire area is unique to Pittsburgh and is some of the prime tourist things to see while you are here. Originally used as a picnic shelter, the Schenley Park Café and Visitor Center building was designed and built between 1903 and 1904 by Pittsburgh architectural firm of Rutan and Russell (other work by the firm includes the University of Pittsburgh’s William Pitt Union, formerly the Schenley Hotel). Two similar shelters that no longer exist were built around the same time but were torn down over the years. The Visitor Center is one of the few surviving buildings from the early days of park construction. In its over 100 years in the park, the building has served as a concession stand for Phipps Conservatory, a tool shed in the 1930s, a workspace for the Pittsburgh Civic Garden Club, a nature museum housing snakes and other park creatures, and an office for workers conducting park repairs. Prior to the Parks Conservancy’s restoration project in 2001, the building had been closed to the public since the late 1980s. 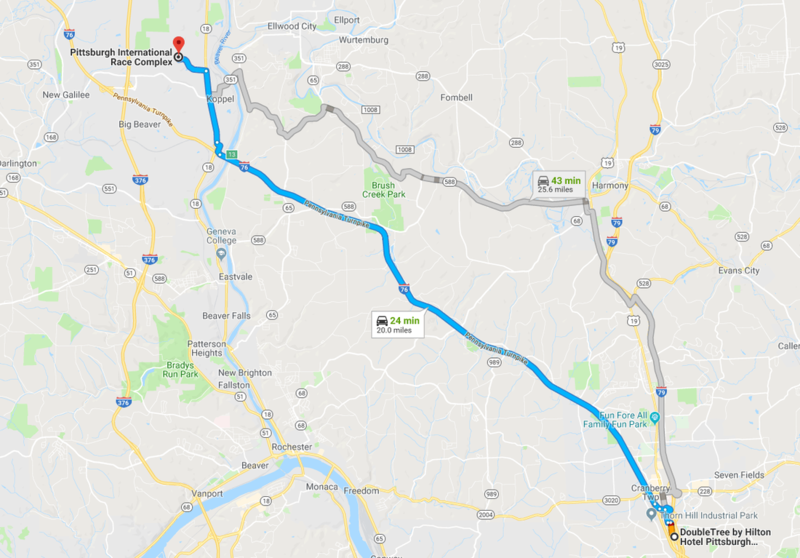 12:30pm - 1:15pm The next leg of the driving tour departs Phipps and puts you directly on the PVGP Race Course. You'll be entering at Turn 8 at the Visitors Center where you had lunch and will pass through the remaining 20 turns of the track, cross the Start Finish and exit off of what will be Turn 4 of the race track. You'll sneek through some back roads and cross the hot metal bridge into the historic South Side Strip on Carson Street. 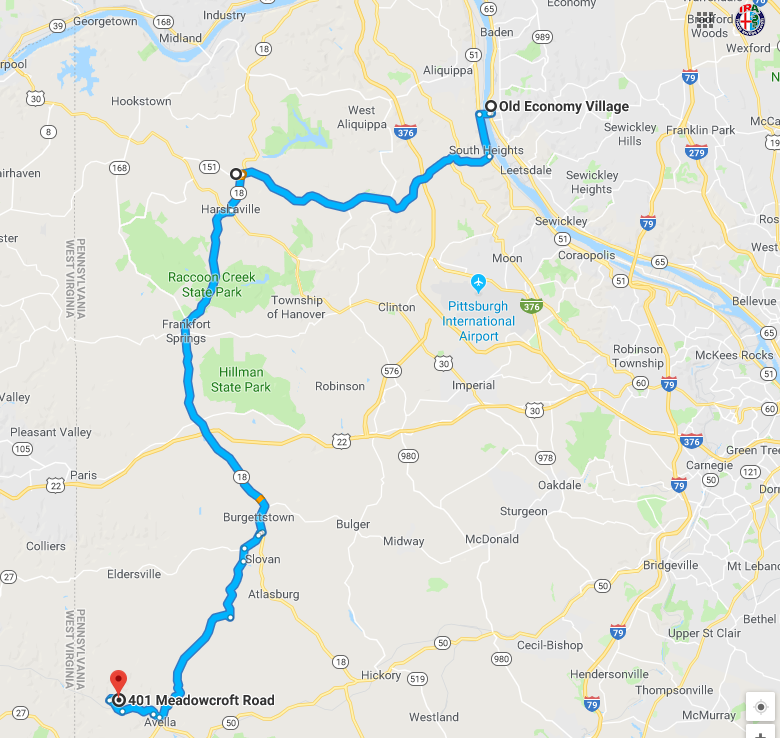 You will then wind your way up Sycamore Street, past one of the scenic locations of the 1993 movie Striking Distance with Burce Willis adn finishing at the scenic overlooks on Grandview Boulevard. You can can check out the Monongahela Incline and walk around for a bit. Regardless of which place you decide to eat, you can stop over to the Duquesne Incline and check out the museum there or catch a round trip ride on the incline. Fallingwater is a house designed in 1935 by renowned American architect Frank Lloyd Wright (1867-1959). The house was designed as a private residence and weekend home for the family of Pittsburgh department store owner, Edgar J. Kaufmann, Sr. Fallingwater is one of Wright’s most widely acclaimed works and best exemplifies his philosophy of organic architecture: the harmonious union of art and nature. Fallingwater is located in the mountains of Southwestern Pennsylvania, also known as the Laurel Highlands, in Mill Run, Pa. in Fayette County, which is about 70 miles east of Pittsburgh. Wright designed Fallingwater to rise above the waterfall over which it is built. Completed with a guest house and service wing in 1939, Fallingwater was constructed of native sandstone and other materials quarried from the property. Fallingwater was built by local craftsman from Fayette County. ATLANTA — (October 3, 2018) – Forbes Travel Guide today released its inaugural Verified Lists, naming Falling Rock at Nemacolin Woodlands Resort among the 58 Most Luxurious Hotels in the World. Inspired by the architecture of Frank Lloyd Wright, the boutique Falling Rock at Nemacolin Woodlands Resort takes its cues from nearby Fallingwater, one Wright’s most famous architectural works, designed in 1936. Everything from the lampshades to wastebaskets was carefully thought out by architectural designer David Merritt, who had the task of bringing Falling Rock to life, inside and out. Anyone who is a fan of Wright’s work will thrill to the geometric patterns, natural stonework and every other intricate detail that Merritt incorporated into the hotel. And while guests never have to leave Falling Rock, which has its own gourmet restaurant, fitness room, hot tub and heated outdoor infinity pool, they do have access to all the amenities and activities Nemacolin Woodlands Resort offers. Click Here for maps & directions from. Shadyside has changed drastically over the past two centuries. Originally farmland, Shadyside began evolving into a residential neighborhood in the late 1800s. It remained primarily residential until the 1950s, when Walnut Street’s retail stores began to expand. Roslyn Place, a short street off of Ellsworth Avenue, is one of the country’s only remaining wooden streets. The tiny cul-de-sac is “paved” using 26,000 oak blocks. Old Economy Village, a National Historic Landmark, tells the story of the Harmony Society, one of the oldest and most successful religious communal groups of the nineteenth century. The Society sought to create a utopia inhabited by German Lutheran separatists who subscribed to the mystical religious teachings of their leader George Rapp (1757-1847). In Economy, they waited for the second coming of the Messiah. Meadowcroft Rockshelter, the oldest site of human habitation in North America, provides a unique glimpse into the lives of prehistoric hunters and gathers. This National Historic Landmark, located in Avella, Washington County, Pa., features a massive rock overhang used 16,000 years ago for shelter by the first people in North America. The enclosure at Meadowcroft Rockshelter provides visitors with a unique, never-before-seen perspective into the oldest and deepest parts of this internationally-renowned archeological excavation.